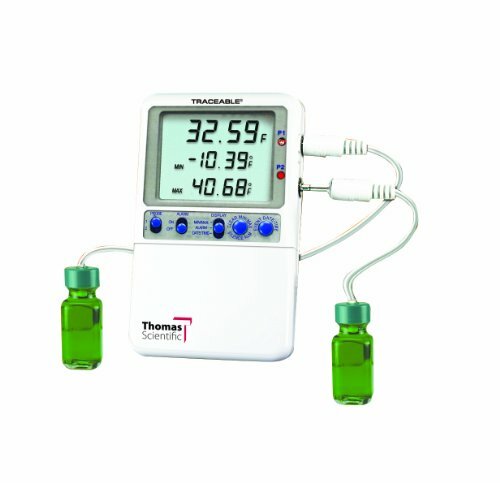 Thomas Hi-Accuracy refrigerator thermometers are NIST traceable and meet all CDC requirements for thermometers and vaccine thermometers. 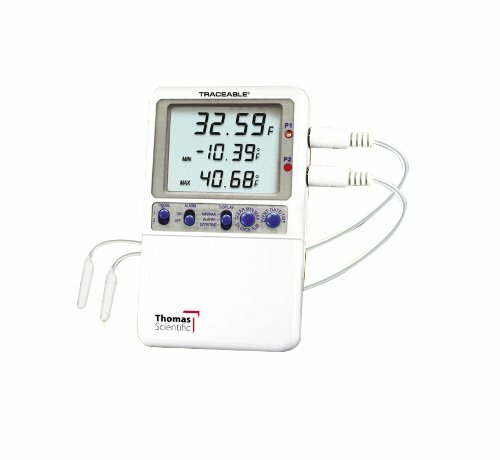 The dual-read thermometer has a -58 to +158 degrees F/-50 to +70 degrees C temperature range with +/- 0.3 degrees C accuracy for use in refrigerators, water baths, heat blocks, and incubators. It includes a choice of temperature-buffered bottle sensor or probe-style sensor. Probe sensors are waterproof and chemically-resistant. Probe sensors have a 3/16" diameter and are 3/4" long. Temperature-buffered bottle sensors contain non-toxic glycol and insulate the probe to make it less susceptible to temperature fluctuations when the door is opened. The glycol solution is generally recognized as safe (GRAS) by the FDA. Bottles are 2-1/2 x 1 inches ((H x W, where H is height, the vertical distance from the lowest to highest point; W is width, the horizontal distance from left to right). The 10ft. long micro cable allows doors to close tightly over the cable. Thermometers are used to measure temperature for various applications such as education, general-purpose QC labs and research lab testing, and for biological process monitoring. The thermometer has receptacles for up to two probes, has a 0.01 degree resolution, and displays temperature in Fahrenheit or Celsius. 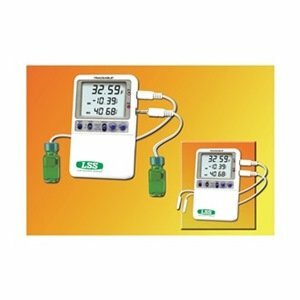 The three-line LCD simultaneously displays minimum, maximum, and current temperature for one probe at a time. Temperature alarms can be set in 0.1 degree increments. Two-channel alarm provides visual and audible alarms for out-of-range temperatures for each probe independently. The alarm continues to sound even after returning to non-alarms range. The thermometer records the date, time, and length of time the probe was exposed to out-of-range temperatures. The thermometer has a high-impact, chemically-resistant ABS plastic case. It is 4.25 x 2.75 x 0.75 inches (H x W x D, where H is height, the vertical distance from the lowest to highest point; W is width, the horizontal distance from left to right; D is depth, the horizontal distance from front to back), and weighs 5oz. The thermometer has a built-in stand and wall-mounts, or can be mounted with Velcro or magnetic strips. It is powered by two AA batteries (included) that provide up to one year of continuous monitoring.